Many ISRC functions are staffed by volunteers each year. We have not encountered the need for a tablecloth until now and we have 2 for use with ISRC functions. Recently, the approval was sought and obtained to have these made for us. The tablecloths lend a great appearance for use at conferences, displays, career day gatherings, etc. Additionally, it was decided that brochures about our ISRC be developed and made available in the cloud folders or upon request. ISRC brochures for “Who are We? 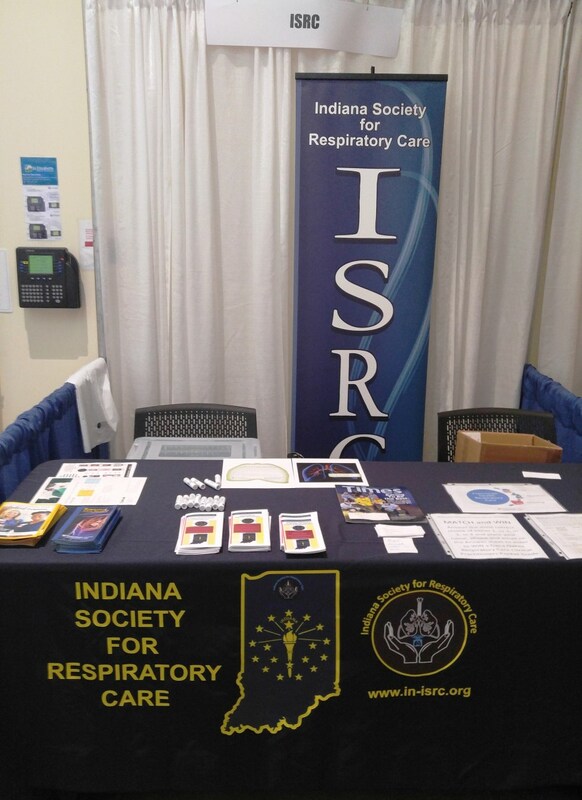 – Meet Your 2018 ISRC”, “Scholarships for Respiratory Therapy Education”, and “ISRC Indiana Respiratory Initiative” are available and others are planned. Many other societies have these and it is a direct result of the intent to manage service, improve awareness and create a professional appearance for our target audiences. Contact John Murphy or Jeff Scott to acquire a tablecloth, or brochures and sign items out for approved uses. Also, the display could be signed out with approval, so keep that in mind with regard to ISRC volunteer activities.